Setúbal was once again the Eurovision city for one night as the Eurovision Live Concert - Portugal's Eurovision afterparty - took place at that venue to celebrate its 10th anniversary. 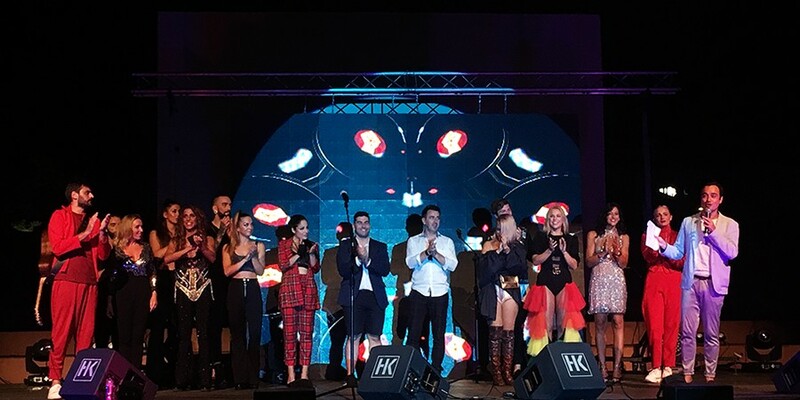 As reported, many Eurovision stars such as Madame Monsieur, Ira Losco or even Poli Genova took the stage to promote new material and remember everyone of their Eurovision anthems. Eurovisionworld got backstage with a few of them for a little catch up that will be revealed in the following days. It is safe to say that this year's edition featured the boldest production so far and brought back the Eurovision spirit in its best way. Not only there was smoke and fire on stage but there was even time for a little flag parade as every artist invited – except Poli Genova that arrived a little later than scheduled – stepped on stage before the performances kicked off. It was a great moment. With a delay of roughly half an hour, the performances started with Spain's 2011 representative Lucía Perez. The Spanish singer took the stage to perform her Eurovision entry - "Que Me Quiten Lo Bailao" - along with two others including a homage to Portugal's very own Amália Rodrigues. Carla Ribeiro and Gerson Santos – both Festival da Canção hopefuls – were next. Carla paid a quick homage to Albania's entries of 2009 and 2010 and Simone de Oliveira's 1965 "Sol de Inverno" while Gerson Santos showed how much he loved this year's edition by performing Ireland's "Together" and Germany's "You Let Me Walk Alone". Anabela – Portugal's 1993 representative – was next. The Portuguese singer had performed at last year's edition and was happy to be back. Following last year's steps, Anabela delivered an emotional performance of "A Cidade (Até Ser Dia)" with the audience singing along to every word. It was time to comeback to the international stars with Mickey Harte from Ireland (2003) who delivered great performances solely with his guitar followed by Ira Losco, Malta's 2002 and 2016 representative. No one could predict that the Maltese singer would suffer a few technical issues, not her fault thought. Ira performed two songs off her brand new double album ("No Sinner No Saint") and a mashup of her 2016 Eurovision entries "Walk On Water" and "Chameleon". While everything went fine on "Hey Now", she quickly asked for the playback karaoke of "Me Luv U Long Time" to stop: "I cannot sing at that pace. I'd be Speedy González", she joked. It took the production roughly five minutes to fix the issue and the diva herself made it look like nothing had happened. Also Portugal's Festival da Canção hopeful, Carlos Costa, made a comeback to the event and proved to be (again) a big Eurovision fan by bringing a few fan favorites such as "Be My Valentine" and this year' "Fuego". The Portuguese singer presented a very similar performance to Eleni Foureira's original and ended up delivering a very powerful performance. Poli Genova and Justs were next and made sure to continue what Carlos Costa had started. While Poli made everyone fall in love with her sweet smile, humbleness, the lovely "If Love Was a Crime" and the powerful "Na Inat", Justs had every girl screaming for him and singing along to every word of "Heartbeat". It was time for Krista Stigfrieds who quickly robbed everyone's attention. Not only the "Marry Me" singer sang her Finnish version of Portugal's "Quero Ser Tua" but she demanded that everyone stood up and clapped along. On top of that, her outfit was quite something as it was obviously a statement of acceptance and tolerance with the rainbow flag being represented in it. Needless to say that "Marry Me" won everyone over with a very electrifying and fun performance. There was only one act left to perform: this year's Madame Monsieur who were received in a very warm way. The duo performed two songs from their second record ("Vu D'Ici") and finished with an emotional performance of "Mercy" as every act - except Anabela - joined them on stage and showed that Eurovision is capable of bringing people together and there's no time for hate or rivalries. With every act on stage, Madame Monsieur sang "Mercy" once more with a little help from Krista, Lucía, Justs and others. At this point, the entire audience was standing up singing and putting their hands up to the "mercy, mercy" part. There was no better way to close the tenth edition of this year's Eurovision Live Concert.